Finally Volkswagen offers North Americans a full-size 7-seat option with the all-new 2018 Atlas SUV. Will it be enough to win back consumers’ trust? Calgary, AB – Volkswagen’s North American sales are creeping up again as the company recovers from the damaging Dieselgate scandal, but it still has a lot of ground to make up. As the huge recall and compensation program progresses – around 590,000 vehicles in the US alone, not to mention $25bn in US legal settlements – it’s reshaping its range in a bid to move “deeper into the heart of the American market, moving from a small-car brand towards a more family-friendly lineup,” according to the company. If there’s an irony in the company pinning its post-Dieselgate hopes on a mid-size SUV with a thirsty gasoline V6, then I’m sure it’s not lost on Volkswagen. The new, 7-seat Atlas goes head to head with established rivals like the Honda Pilot, Nissan Pathfinder and Ford Explorer. It’s been designed specifically for the North American market and was tested extensively there before going into production alongside the Passat in Chattanooga, Tennessee. We spent a week with a range-topping Execline (roughly equivalent to the SEL Premium in the US) to see how it shapes up. To state the obvious, the Atlas is an SUV, not a minivan – VW has no wish to evoke memories of the unloved Routan and has recognized that SUVs now outsell minivans (though the good old family mover is making a sort of comeback with the likes of Chrysler’s all-new Pacifica, Pacifica Hybrid, and 2018 Honda Odyssey). As such the rear doors hinge conventionally outwards rather than sliding back, but VW has nonetheless tried to endow this SUV with minivan-like interior space and accessibility. In order to fulfil the brief, the Atlas is likely the biggest Volkswagen you’ve ever seen: longer, wider and higher than a Touareg, it’s sized properly for what it’s designed to do. VW describes the looks, which evolved from the CrossBlue concept of a few years back, as “wide, earnest and substantial, but not too aggressive”. It’s noticeably less rounded than some of its rivals, with chiseled edges and some nice details in and around the grille and LED lights. A long wheelbase helps ensure that the generous exterior dimensions translate into good interior space. The Atlas makes good on its promise of easy access, too. The middle row can be flipped forward with booster seats in place, for example, to make it easier to reach the third row, where two adults can sit in surprising comfort. Less convincing were the two middle-row, heated ‘captain’s chairs’ fitted to our test car’s ‘Captain’s Package’. For our money these were neither wide nor supportive enough and the comfort of second-row adult passengers wasn’t helped by the lack of seat-belt height adjustment. Luggage space with the third row folded flat is fine, but the Atlas might not swallow everyone’s gear if six or seven of you are spending a week or two away. In this respect the high-riding SUV can’t match, say, a Pacifica or (whisper it quietly) a Routan. By way of comparison, that thinly disguised Dodge Grand Caravan offered 32.3 cu.ft. of luggage space with all three rows in place, whereas the Atlas manages only 20.6 cu.ft. The Atlas is the largest vehicle to be based on Volkswagen’s ubiquitous MQB architecture. That not only contributes to a competitive price through economies of scale (the entry-level Trendline starts at C$35,690), but to a pleasingly car-like and reassuringly VW-esque driving experience. The powertrains are tried and tested, too. The Execline comes as standard with the venerable 3.6-liter V6 and 4Motion AWD; a 2-liter TSI that makes almost as much power – 235bhp vs 276bhp – and FWD are available elsewhere. Both setups get an 8-speed automatic transmission that does a good job of keeping you in the right gear at the right time. Serious towing – up to 5,000 lb – requires the V6 and power to all four wheels. It’s a combination that’ll seldom leave you short of torque and traction, but the resulting 19mpg combined fuel economy can’t match that of the newer motor in the Honda Pilot. For a sizable SUV, the Atlas is easy and responsive to drive, thanks in part to accurate steering and good suppression of pitch and roll. The relaxed damping, allowing the body to bounce a little over big undulations, is decidedly North American rather than European. That comfort-first approach to suspension tuning would be fine, except for the fact that short, sharp impacts from potholes or exposed drain covers aren’t smothered in the way that you would hope. The Execline’s stylish ‘Mejorada’ 20-inch alloys and shorter-sidewalled tires likely don’t help here. If you don’t mind the way it looks, I’d recommend trying the Atlas on 18-inch wheels (standard on other grades) if you get a chance. I was also able to try an Atlas on a narrow, dry and dusty off-road course. In off-road mode, the vehicle wasn’t stumped by anything we encountered but the light steering limited your feel for the terrain. Meanwhile the automatically activated, overactive hill descent control turned each steep descent into a frustrating battle of man vs machine. The Execline justifies its C$52,540 price tag with just about every creature comfort you could wish for. The Captain’s Package (C$625) was the only option fitted to our test vehicle, which came as standard with black/golden oak Vienna leather seats, an excellent 12.3-inch reconfigurable digital instrument cluster, 360° overhead-view camera, a superb Fender audio with 12 speakers and a subwoofer, lane keeping and park assist systems and a trailer hitch. For a sizable SUV, the Atlas is easy and responsive to drive, thanks in part to accurate steering and good suppression of pitch and roll. The relaxed damping, allowing the body to bounce a little over big undulations, is decidedly North American rather than European. Overall, the interior has that semi-premium feel that Volkswagen does so well, with the only real hiccup being the obviously plastic fake-wood trim on the dash and door inserts. Elsewhere, family-friendly features abound, including enough USB charge points for everyone’s gadgets, a 115V power socket and a panoramic sunroof. In conclusion, we’ll return to the brief. 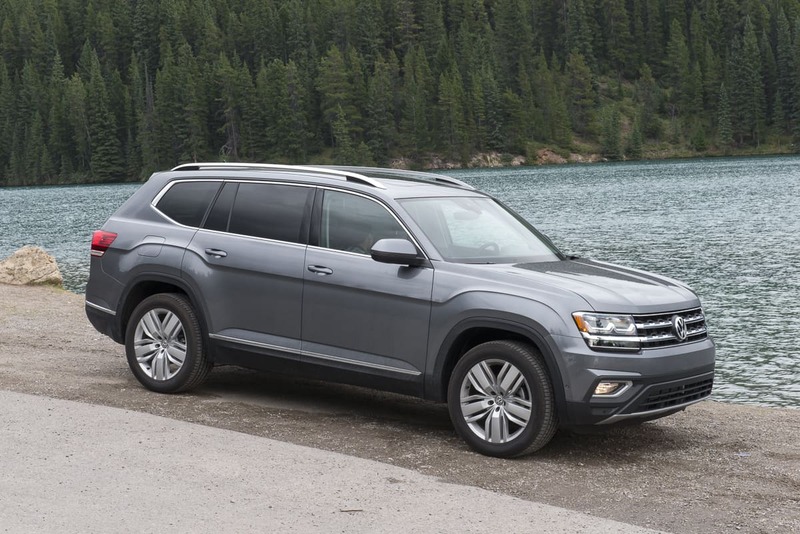 Volkswagen designed the Atlas for North American families who have an active lifestyle. In its own words, it’s a car to travel “to a National Park or the lake house on the weekend…a car that delivers freedom”. It’s meant to haul people and stuff, comfortably and safely, at a reasonable price. The Atlas is the car that VW-loving families with more than two children, or older kids, have been waiting for. For the most part, it doesn’t disappoint, and will sure win over customers from other brands, too. It remains however something of a hybrid – not in the powertrain sense, although it could use some electrification to improve the fuel economy – but in the sense that it doesn’t entirely avoid the compromises one would make in picking an SUV over a minivan. It’s easy to get in and out of, but my under-10s struggled to shut those hefty rear doors. It’ll seat seven in comfort, but it won’t swallow seven people’s vacation luggage, too. Does this matter? That depends entirely on the buyer’s priorities. The clear shift in consumer preference from minivans to SUVs reveals that many families have already traded ultimate practicality for an SUV’s style and go-anywhere attitude. With that in mind, there’s no doubt that VW has backed the right horse for its all-American newcomer. The 6-year/72,000-mile US warranty (4 years and 80,000km in Canada) should prove attractive, too, and perhaps rebuild a little of that all-important trust in the brand in the post-Dieselgate era. No, you probably won't own the Chevrolet Colorado ZH2 anytime soon - a midsize, fuel cell powered pickup unveiled today at the US Army Show.